No matter what it is, he finds a way to chew on anything. I’m finding little teeth marks all over the place… on toys, the crib rails, his books, MY CHEEK… He keeps tricking me. He’ll open his mouth and look at me, like what he does when he wants to give me a kiss, so I’ll lean in and give him my cheek to kiss. Instead, I get BITTEN. By sharp little baby teeth. I’m looking forward to all his teeth finally coming in! This entry was posted by Jen on March 12, 2010 at 10:43 pm, and is filed under Uncategorized. Follow any responses to this post through RSS 2.0.You can skip to the end and leave a response. Pinging is currently not allowed. 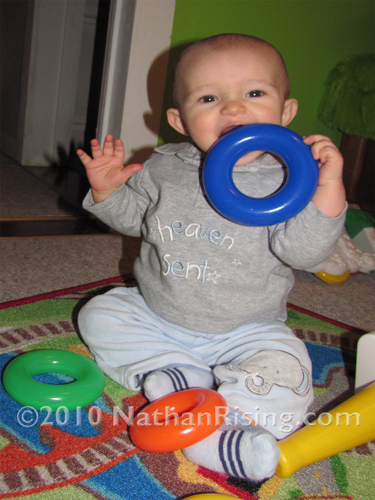 Teething! My MIL told me that they won’t stop teething till they are 25! LOL.